There are literally hundreds of terms used in the lighting world. Most of them are technobabble that only engineers need to understand, but the terms below are important to be familiar with if you’re thinking about upgrading your lights to LEDs. An electronic component that is required to start fluorescent bulbs. Ballasts typically need to be replaced every 2-4 years. The angel at which the light from a bulb is spread. A wider beam angle will leave a larger circle of light on the floor, but that circle won’t be as bright. Beam angles of 25 are commonly called spot lights; beam angles of 40-60 are commonly called flood lights. CRI is a scale from 1-100 that measures a light source’s ability to show true color. Natural sunlight, at noon, has a CRI of 100. A light bulb with a CRI of 100 would show colors exactly as they would appear in sunlight at noon. A foot candle is a unit of useable light on a surface. A foot candle measurement of “1” is the amount of light on a 1 square foot piece of white paper that is one foot away from a single candle. In the real world, it’s important to remember that as a bulb gets further away from a tabletop, the foot candles decrease. So, if you have higher ceilings, you would logically need brighter lights to get the same amount of useable light (foot candles) on your table. The standard measure of electricity used by power companies. Ten 100 watt light bulbs burning for 1 hour use 1 kilowatt hour of electricity. Rates per kilowatt hour vary across the country, but most are around 12-18 cents per kilowatt hour. A light emitting diode, also called solid state lighting…currently the best source of light on the market. The sum of all costs to operate the lighting in facility. These costs include: electricity, cost of replacement bulbs, cost of replacement ballasts (if applicable), and the labor to change bulbs and ballasts as they burn out. The amount of light a bulb puts compared to the amount of power it consumes, measured in lumens per watt. Basically, how efficient a light bulb is. A lumen is a unit of light put out by a bulb. The higher the lumen value, the brighter the light. 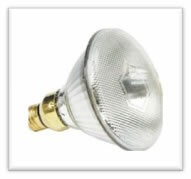 As a point of reference a 100 watt, standard incandescent light bulb puts out about 1700 lumens. Tiny little PAR bulbs that are found in pendants. The point at which the lighting cost savings of an LED upgrade equal the cost of the LED upgrade. For example, if an LED upgrade reduces lighting costs by $100 per month and costs $1200, it would have a payback point of 12 months. Parabolic Aluminum Reflector bulb. Commonly call spot lights or flood lights that are usually housed in recessed cans or on tracks. The most common types of fluorescent tubes. The number refers to the diameter of the tube in 8ths of an inch, so a T8 is 1 inch in diameter. Wattages vary, but typically a T-12 uses 40 watts, a T8 uses 32 watts, and a T5 uses 28 watts. A unit that houses fluorescent tubes or LED lights that is typically found in a drop ceiling. The amount of time it takes for a light bulb to reach full brightness. Fluorescent tubes can take several minutes reach full brightness. High quality LEDs will start instantly, or take no more a half a second to reach full brightness. © 2012-2015 SkyOnLighting, LLC. All Rights Reserved.